Looking for things to do in Newbury? Well, check out our 10th Anniversary Concert at the Corn Exchange, and remember to bring your family and friends. 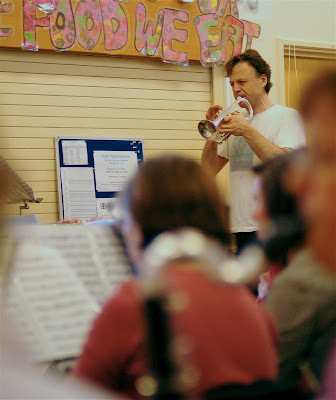 Last night Torbjorn Hultmark came to rehearse his own arrangement of Arban’s Carnival of Venice, for band and solo cornet. It’s a well-known piece, and gorgeous to listen to. When I was at school I learned the lowbrow version, “Mein Hut Der Hat Drei Ecken”, a German drinking song, complete with actions, which we used to practice, much as the girls are doing in this clip from Youtube. The Corn Exchange audience on Saturday will, by contrast, be treated to a fantastic virtuoso performance of the theme and its many variations, played by Torbjorn himself, accompanied with style and panache by the Beenham Band. Get your tickets here. My comment has disappeared! We did it faster!